To be clear, space debris poses considerable risks; however, to understand those risks, I should explain what it is and how it is formed. The term "space debris" refers to defunct human-made objects, relics left over from activities dating back to the early days of the space age. Over time that definition has expanded to include big and small things like discarded boosters, retired satellites, leftover bits and pieces from spacecraft, screwdrivers, tools, nuts and bolts, shards, lost gloves, and even flecks of paint. From the 23,000 pieces of debris in Earth orbit that are larger than 5-10 centimeters that we can track and catalog, to the hundreds of millions that we cannot, there is little question that both big and small objects whizzing around at lethal speeds endanger the prospects for civilian, commercial and military missions in outer space. You may pick apart what the movie "Gravity" got wrong, but what it got unforgettably right was the sense of devastation wrought by an orbital debris cloud that destroyed equipment and killed three astronauts on impact. No matter its size, space debris can be lethal to humans and machines alike. 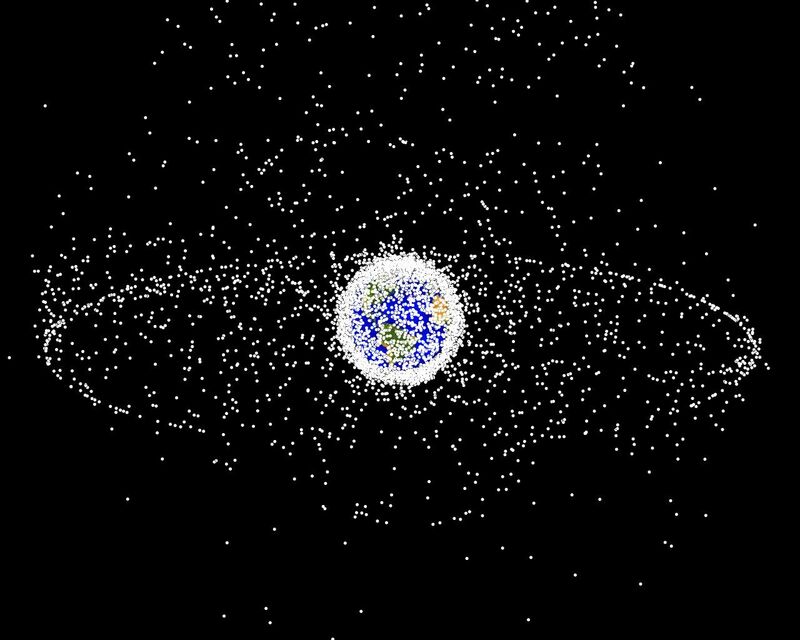 Space debris may also be affected by the breakup of older spacecraft. In February 2015, a Defense Meteorological Satellite Program (DMSP-F13) spacecraft, called USA 109, which had gone up 20 years earlier, blew up due to a battery malfunction. 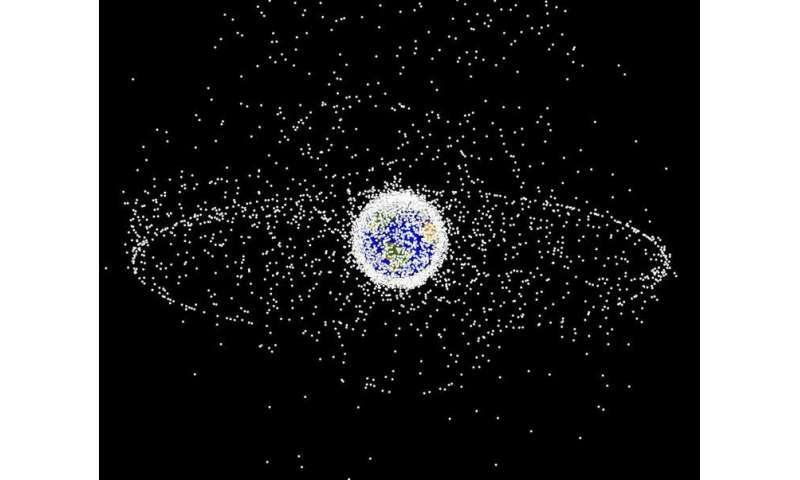 It may have contributed 100 debris pieces that were tracked by military radars on Earth, and possibly also 50,000 shards larger than 1 millimeter that defied tracking because they are too tiny. Because of the satellite's original high altitude, all those fragments will remain in orbit for decades, posing risks for other spacecraft. In November 2015, again due to a possible battery failure, another decommissioned U.S weather satellite, NOAA-16, crumbled adding 136 new objects to the debris cloud. Debris can also fall back down on Earth, whether from natural orbital decay or controlled re-entry. Fortunately most such falling debris lands in the Earth's oceans. But sometimes it does not, and these rare events may become a bigger hazard in the years ahead as the size of the debris cloud grows, and as the projected fleet of commercial small satellites becomes a reality. Recently, parts of Zenit rocket debris are reported to have ended up crash-landing in Peru. One of the most recent such events just took place in October 2018. 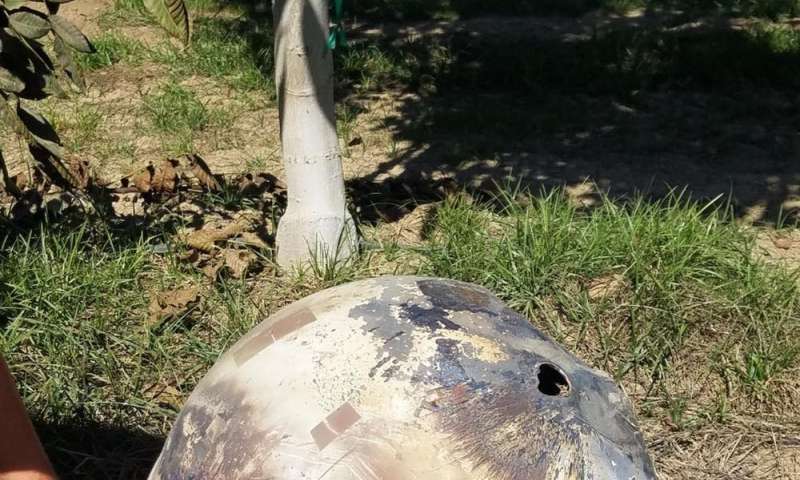 The U.S. military identified a fuel tank from a decade-or-so-old Iridium satellite that crashed in a walnut orchard in Hanford, California. China's actions were widely seen as an anti-satellite test (ASAT), a signal of the country's expanding military space capabilities. Having the ability to shoot down a satellite to gain a military advantage back on Earth exposes the basic nature of the threat: Those who are most dependent on space assets – namely, the United States, with an estimated 46 percent of the total 1,886 currently operational satellites – are also the most vulnerable to the space debris created deliberately. There is no doubt that the aggressor will also lose in such a scenario – but that collateral damage may be worthwhile if your more heavily space-dependent rival is dealt a more crippling blow. The same technology that captures or zaps or drags away the debris can do the same to a functioning spacecraft. Since nobody can be sure about the intent behind such proposed "commercial" space debris cleanup technologies, governments will race to get ahead of their market competitors. It matters how and with what intent you counter space debris with dual-use technologies, and more so at a time of flux in the world order. Both the old and new space powers can easily cloak their military intentions in legitimate concerns about, and possibly commercial solutions to, debris hazards. And there are now a number of open assessments about space junk removal technologies that can double up as military programs, such as lasers or hunters. This is how we have ended up in a counterspace race, which is nothing like your grandfather's space race. In a fundamental way, this new race reflects the volatile geopolitics of peer or near-peer competitors today, and there is no getting away from it in any domain. Just as on Earth, in the cosmos the world's top space powers – the United States, China, Japan, Russia, India – have moved from merely space situational awareness to all-out battlespace awareness. 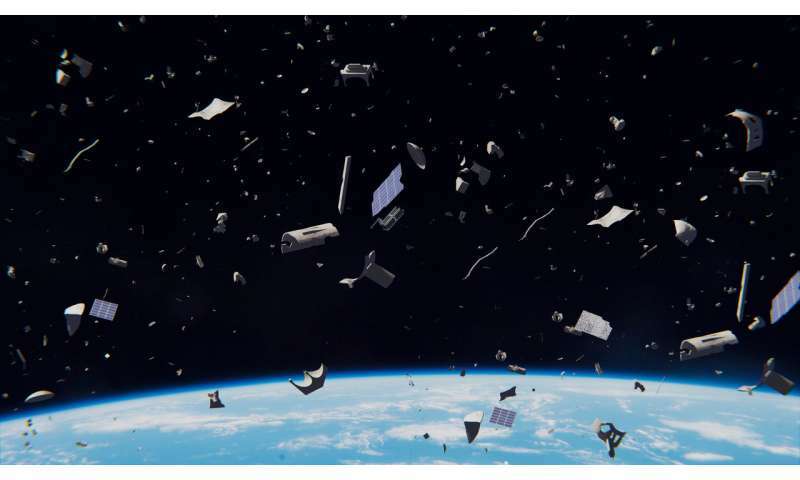 If things stay the course, accidental or deliberate events involving orbital debris are poised to ravage peaceful prospects in outer space. How then do we move forward so that outer space remains safe, sustainable and secure for all powers, whether big or small? This is not a task any one single nation—no matter how great—can carry out successfully on its own. The solutions must not only be technological or military, either. For peaceful solutions to last, deterrence and diplomacy, as well as public awareness, will have to be proactively forged by the world's space powers, leaders and thinkers. Scotty - I need those shields NOW! I suggest the "Hermit Crab Strategy" for Manned Mars mission. Expensive on the delta/v budget but doable with current tech. Gather up all that mass of junk & scraps using trawler style drones with nano-webbing. Glue it all together into a big, outer shell, outside a smaller inner shell. With enough room for a manned ship inside of the combined structure. No need to risk Human lives until the manned ship launches from Earth. In orbit, it slips intside the double shell & pushes off for a gravity-assist from Luna & then Earth/Luna. No, you do not need to see where you are going. Cameras outside the hulls are quite sufficient. The velocity the Hermit Crab achieves would be beyond Human capability. Robot pilot, all the way. During the voyage the outer hull collects incoming radiation & Sun farts & BB pellets. Reaching Mars, before the return trip. The contaminated, ablated outer hull is discarded. Return trip protected by inner shell & needing less fuel. willis wants to build a trawler by dragging a net through the earths oceans, gathering whatever crap and garbage is floating there, dragging it all to one spot, and assembling all this metal, plastic, wood, etc. into something that would actually float. Only we can imagine that the actual territory in space is many times larger and the crap floating around there, while similar in composition, is traveling at extreme velocities and in all different directions. Willis cant understand that it would be far easier, cheaper, and quicker to build components and haul them up into orbit than to try to use GARBAGE to build trawlers. But willis dont care - he just likes using fancy prose to describe nonsense. Its fun. Maybe people will mistake it for logic and reason. Naw willis your ideas are like the garbage floating in the the oceans of the world. You can go to great effort to gather it all up, but you will never ever make anything useful out of it. Except more garbage. The headline looks like clickbait. It's not the cleanup effort that's the security risk, it's the presence of stuff that needs to be cleaned up. Meanwhile, @Blotto bloviates aside from the subject of the article as usual. Actually commenting on the article, this is something that desperately needs to be dealt with, and for which the existing systems are competent. But I doubt the Republicans in the Senate will deal with it. Just think of me as the siskel and Ebert of physorg. Double thumbs down to made-up nonsense. Say - when's your next production? Well DS, I am the village atheist, infamous for disbelieving in the common rationals for Manned Space flight. You have no idea of the effort it takes for me to say anything positive about what I consider a fruitless endeavor. So, out of my deep humanist convictions? Once in a while, I try to suggest something positive to contribute to the sales brochure for New Jamestown and Pilgrim's Progress. ottogimli is frothing at any ideas too sensible for his comicbook driven fantasies. Try and disregard the silly little creature. It will drive him/her/it absolutely mad with frustration. Have I mentioned lately that I am a sadist and subotto begs for another taste of my flogger? Naaaw just turds wrapped in bad poetry. Well certainly big govt cant and wont. Ambitious entrepreneurs like musk will be building large multipurpose solar farms in space which can power large multipurpose lasers. When they arent propelling payloads around the system, they can be deorbiting space junk of all sizes, and charging govts for it. A goldmine. Many profitable uses for systems like this. And no govt can be trusted not to use them as weapons. Well otto, whoever has the command codes will be the government! To quote that Ancient Wise Sage Mao Tse-Tung "Power flows from the barrel of a gun!" And what does the wise sage have to tell you about chasing down spent carbon fiber fuel tanks, aluminum foil, and steel wrenches orbiting at different altitudes and different trajectories, on opposite sides of the planet, and gluing them together into a spacecraft?